This is taken from a pdf entitled "NEOLIBERALISM - BED MATE TO FASCISM" by Robert Golden. It has been edited by Australian Voice. Why? Because it is the almost unknown but dominating cultural, social, political and economic idea in our time which has redesigned our lives for the worse. It was germinated by a group of right wing economists between the early 1950’s through the 1970’s. (1) Then it was financed by wealthy American corporations and rich individuals until it almost invisibly became policy imposed upon us after 1980. It was advocated first by Reagan and Thatcher and later by their pet fascist, Pinochet in Chile. Since then it has contaminated most other economies and cultures and completely pervaded the Anglo-Saxon countries such as the US, the UK, Australia and Canada. A few years ago a man was asked to institute a redesign of the Financial Times. He was told to take the overall plan and break it down to 1000 changes. Every day for three years he instituted one of those changes. By the end of the third year the paper looked entirely different. As the editors suspected, no one knew when the changes began. It was as if somehow the changes had occurred before the reader’s eyes, but without them recognizing how or when they happened. This is how we missed seeing the construction of our new neo-liberal society. At no one moment did we recognise a new policy or a new sell-off of the Commonwealth Bank or Telecom - now Telstra - was a part of the long-term plan to transfer all wealth to the richest 1%. The policies introduced to Australia after WWII have been completely changed. There is no commitment to full employment, to Australian manufacturing, no provision of low-cost public housing, and the system of free university education introduced by Whitlam has been destroyed. The basic Medicare system is underfunded and extra private health insurance is becoming prohibitively expensive. privatising virtually all public utilities. The Australian Fact Sheet put out by Oxfam in January 2018 shows the results of years of neo-liberal policies. 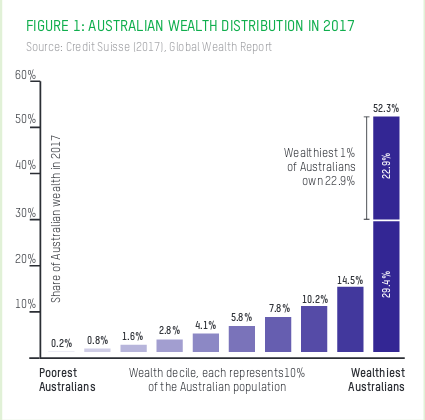 The latest Credit Suisse data shows that the share of wealth concentrated in the hands of the top 1% of Australians in 2017 has grown to 23% – up from 22% in 2016. 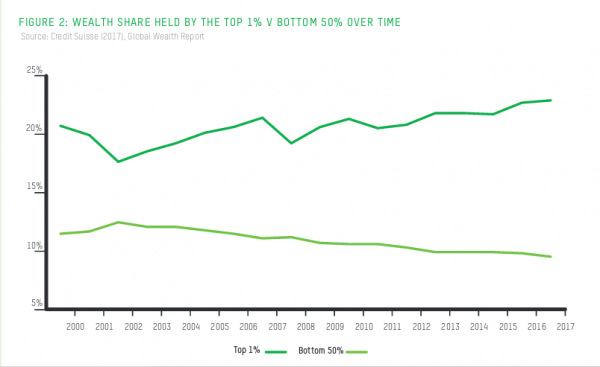 As was the case in 2016, the top 1% of Australians continue to own more wealth than the bottom 70% of Australians combined. The increasing share of Australian wealth held by the 1% is no accident of history. This is exactly what neo-liberal policies were created to do. 1. Friedrich Hayek, Milton Friedman, and Ayn Rand, George Stigler, Ronald Coase and Gary Becker.